Normally, the lack of moisture is not a major concern for agricultural crops grown in Newfoundland and Labrador, so that the need for irrigation water is low or nil. A more important issue is that of the heat required by the crop to reach maturity with good yield and quality. To determine the amount of heat needed to grow a crop, farmers may use an index called growing degree-days (GDD), which is defined as a day on which the mean daily temperature is one degree above a "base" or "threshold" temperature. The "base" temperature, in turn, is defined as the minimum temperature required for the growth of a particular crop. The base temperature for sweet corn, for example, is 10 °C while the base temperature for peas is 5°C. 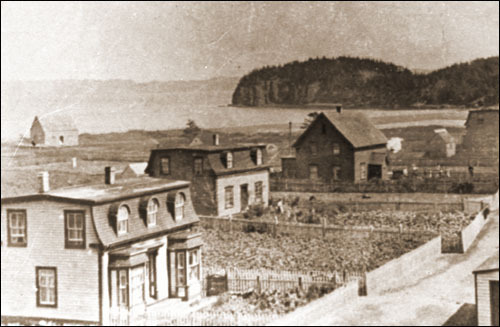 View of Haystack, Placentia Bay, circa 1915, showing potato plants covering the gardens around most homes. This crop was an essential part of the diet of many Newfoundland outport fishing families for most of the 19th and 20th centuries. Courtesy of the Maritime History Archive (Haystack Collection PF-285-011), Memorial University of Newfoundland, St. John's, NL. The GDD sum is most often set at or near 5°C for most mid-latitude agricultural crops. The running total or sum is only begun when the average daily temperature is consistently above the base value in spring (marking the start of the growing season), and ends when the average daily temperature falls below the base for several consecutive days in the fall. Although moisture and other conditions are not taken into account, growing degree-days serve as a useful guide in forecasting approximate dates of crop maturity. To see how GDD data can be used, let us use potatoes as an example. On a summer day in Newfoundland, the mean temperature might be 20°C. On this day potatoes would accumulate (20 C - 5 C) or 15 growing degree days for that day. Theoretically, potatoes need, as a minimum, 1000 to 1100 growing degree days to be ready for harvest. If 15 growing degree-days were obtained for each day of the entire summer, potatoes planted in mid-May would be ready toward the end of July. Unfortunately, this does not often happen in Newfoundland. Most places barely achieve between 1100 and 1200 growing degree-days for the entire season. As a result, potatoes planted in mid-May are usually not harvested until early October. The GDD accumulations for selected Newfoundland locations and the probabilities of these requirements being reached by given dates during the fall, are listed in the following hyperlinked GDD Table. 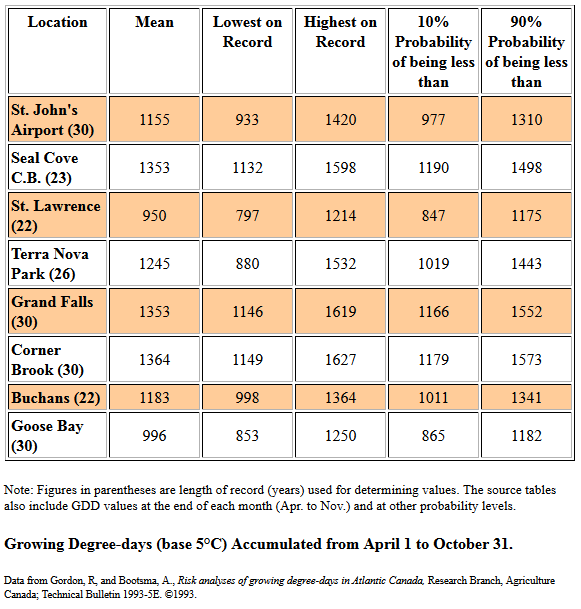 The larger version of the map below provides information on growing degree days for the entire province. From Joyce and Alan Macpherson, The Natural Environment of Newfoundland and Labrador, Past and Present (St. John's, NL: Department of Geography, Memorial University of Newfoundland, © 1981) 106. Adapted by Duleepa Wijayawardhana with permission of MUNCL, 1998. The map shows that the greatest accumulations of growing degree-days (in celsius), above a base of 5°C, between May and October (averaging 1250-1350) are for the sheltered lowland areas of the lower Humber Valley, lower Exploits Valley and the inner parts of Bonavista and Conception bays. However, from an agricultural viewpoint it should be remembered that the central interior valleys are prone to a greater frost risk near the start and end of the growth season. In Labrador the higher degree-day accumulations around Goose Bay, for the same period, reflect the contributions of (1) heat released from storage in Lake Melville in early fall, delaying the autumnal cooling and (2) the local chinook-type heating effects that accompany warm southwesterly winds descending from the interior plateau. Climatic considerations are clearly essential in planning the optimal location and design of reservoirs, recognizing that other socio-economic considerations apply. Annual precipitation inputs (P) and runoffs (R), the seasonal timing of the maximum and minimum amounts, long term variability, and the probability of extreme high and low P and R, are important factors. Annual spring surveys of snow depth and its water equivalent have been conducted over many years for the Grand Lake and Red Indian Lake basins (west-central Newfoundland) and the Churchill River basin, Labrador, in order to estimate the volume of spring runoff into major reservoirs. The accuracy and reliability of these statistics increases with the lengthening of the available data series. As part of a research study into the climate and weather of Gros Morne National Park, a survey of snow cover conditions on the alpine summit area of Big Level plateau, at elevations near 750 metres, is undertaken at the time of maximum snow depth in late winter-early spring. 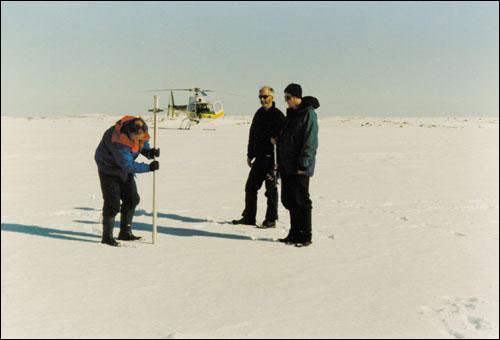 Photograph shows a snow coring and weighting device being used to determine the snow depth and water content at points along a survey line. Image reproduced by permission of Colin Banfield. © 1999. 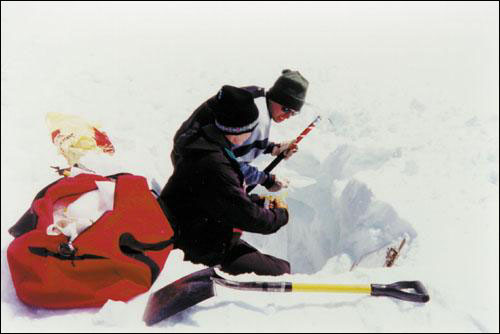 Photograph shows work being carried out at a prepared snow pit. The vertical variation in snow density and the presence of ice layers denoting thawing and re-freezing are recorded, which will be related to the record of precipitation and temperature from the nearby summit climate station (see last two photographs in the article Winter in the Climate section of the website). In addition, samples of snow and ice are being bagged to enable analysis of the changing chemistry of the snow as it accumulated since the previous late fall season; such changes can then be related to the geographical origins of the airflows bringing precipitation to the Gros Morne Park area and compared with other winter seasons. 1. Engineering design and construction of roads and walkways, water supply and storm drainage systems: required climatic information includes annual temperature regime (especially the severity of winter frost and its ground penetration, frequency of freeze-thaw cycles); precipitation amount, types and frequencies through the year, as well as amounts and duration of snow and ice cover. 2. Urban climatic landscaping: incorporation of local climate characteristics and microclimatic principles in the design of residential sub-divisions, open spaces and parks, major public streetscapes (e.g. to reduce effects of high winds and snow drifting, exploit exposure to sunshine). 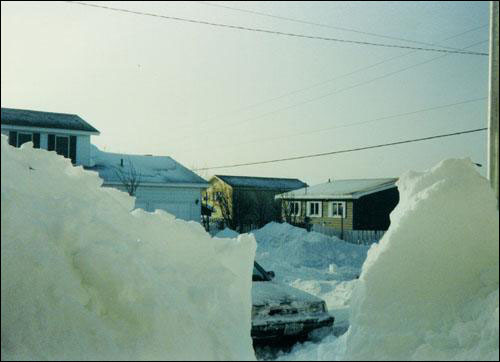 During winters with a succession of heavy snowfalls over a relatively short period (such as in early 1987), accumulations exceeding one metre lead to disruption and slowing of vehicular traffic in urban areas as snow clearing efforts are fully taxed. Such conditions also create difficulties for people on foot due to snow build up on sidewalks, which may force pedestrians on to narrow streets. Reproduced by permission of Colin Banfield. ©1987. Given the vulnerability of highways and transmission lines to certain forms of harsh weather, the planning of new or improved sections should recognise danger areas that are particularly exposed to known weather hazards, and their avoidance or reduction where possible. This may require temporary installation of weather monitoring instrumentation to document locally severe conditions, as is the case with the on-going recording of wind, temperature, precipitation and ice accretion by Newfoundland Hydro at the Hawke Hills test site on the Avalon peninsula. Newfoundland Hydro Icing Test and Measurement Site at Hawke Hills near Holyrood. This site, 6 km. south of Holyrood, is 300 metres above sea level and near the summit. Its elevation, topography and lack of tree shelter can result in very strong winds which, during freezing rain storms, can lead to considerable ice accretion on power transmission equipment. 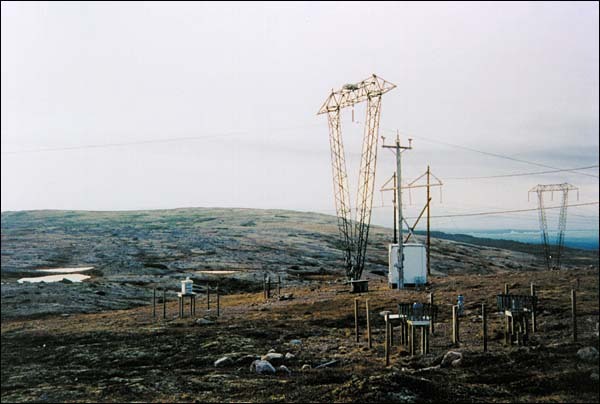 This view, looking towards the south, shows the test transmission line and supporting triangular tower (centre), three recording precipitation gauges, (right foreground), air temperature and humidity sensors in the "screen" ( white box left of centre), passive near-surface ice accretion measurement rods (left of tower), and wind speed and direction sensors (on the pole to right of tower). Reproduced by permission of Colin Banfield. ©1999. All instrumentation is operated continuously by Newfoundland Hydro, enabling the ice loads during freezing precipitation episodes to be related to accompanying meteorological conditions.